Here's a quick recipe I posted in our Weight Loss Support Online group last week. I am posting it in case you missed it and want to Bookmark or Favorite this page to save the idea. Before we get into the details, I want to share some of the health benefits of collard greens, as well as why you should consider using the leaves for wraps in addition to whichever other types of greens you like to use (lettuce wraps, kale wraps, cabbage wraps, etc). Collard Greens are good sources of vitamin C, vitamin K and soluble fiber. They contain nutrients with potent anticancer properties, such as diindolylmethane and sulforaphane. Collard greens are low in calories; they have about 46 calories per 1/2 pound cooked collards and about 11 to 30 calories per raw leaf. Researchers at the University of California at Berkeley confirm that vegetables like collard greens help regulate immune system with potent antiviral, antibacterial and anticancer activity. They are also an awesome source of Vitamin A and are very filling / satisfying food. It used to be that we thought it was best to eat collard greens boiled for a couple of hours with smoked meat bone (ham hocks, smoked turkey, etc) with onions, garlic, a little vinegar (to soften) and spices. They are absolutely delicious this way and especially when mixed with other greens like kale, mustard greens dandelion greens and / or even swiss chard or beet greens. We now know that it is just as delicious and can be even healthier to saute collard greens in a little bit of healthy oil w/ or without onions and garlic. You can also eat the green vegetable as part of salads or wraps if you like the taste of raw collard greens. * The key is in making cure to clean the leaves well (for any leaf veggie) regardless of eating them cooked or raw. The collard green wrap in this picture is around 224 calories (I may have calculated more calories than needed for the one collard leaf). Clean your collard wrap and let it dry. Break off the tail ofthe stem (where no leaf is on it). Lay it flat (dark green side upwards) with the middle stem facing you vertically. 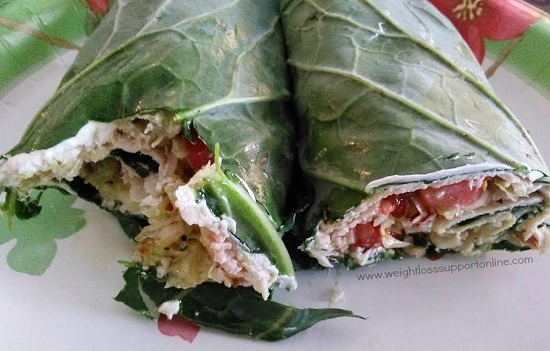 Spread one serving of cream cheese evenly in the middle of the collard wrap. Break up the rotisserie turkey breast on top of the cream cheese. Add the romaine lettuce next and the tomato on top. Turn your plate so the middle collard green stem and food on it is now horizontal. Start at the very end (towards you) and roll it up like you see in the picture above. Cut it in half and serve. A little after my wrap, I had 4 large Brazil Nuts (112 calories) as a "dessert" (such a treat - YUM). Collard Green Wraps work well for fajitas or burritos, too, because their so sturdy (load it up and the filling won't fall out). I hope this Collard Green Recipe / Meal Idea sounds delicious to you or at least interesting enough to give collard greens a try if you don't already eat them. If you do not care for them raw, please try the saute method or the boiling methods explained above. The taste is softened with prolonged cooking, so you can get some of the health benefits of this beneficial green veggie. Of course, keep in mind that nutrition is decreased a bit the longer it is cooked. Eating them raw will give you full vitamins and benefits; especially for your digestion as a healthy food. Blessings to your family and you!